Here, in alphabetical order, is a description of the pet friendly restaurants located in Dunedin (Dogeden), FL. We hope to see the list grow and grow! 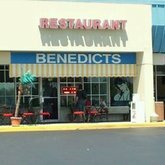 Benedicts is located in a small shopping center close to the Causeway which connects Dunedin and Honeymoon Island. The restaurant is open for breakfast and lunch daily. There is a small outdoor eating area in front of the restaurant that is pet friendly. 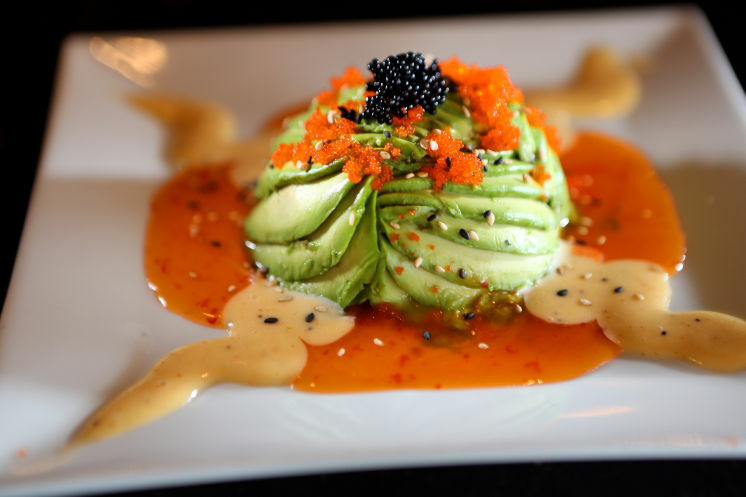 The Black Pearl is an upscale, award-winning restaurant in the heart of downtown Dunedin, known for its intimate environment and excellent food. Open nightly for dinner, the Black Pearl has one outdoor table in front of the restaurant for diners with doggies. 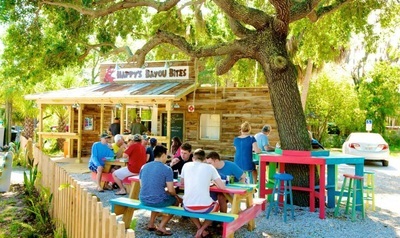 This small "Mom and Pop" restaurant, located on the Causeway which connects Dunedin and Honeymoon Island, serves breakfast and lunch Tuesday-Sunday. A small outdoor area is available for diners with doggies. 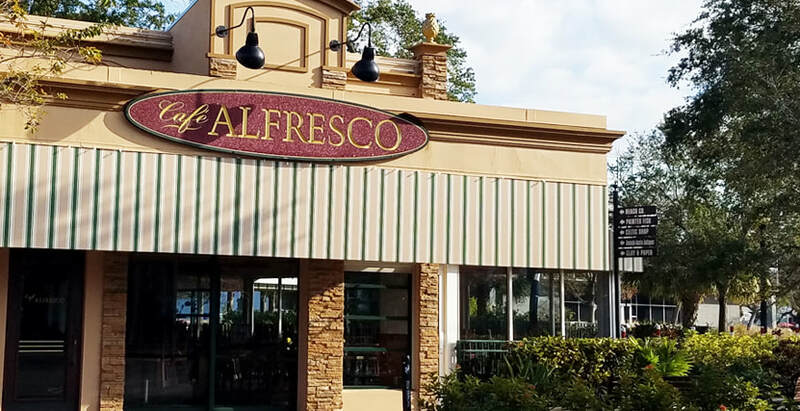 Cafe Alfresco is a casual cafe located in downtown Dunedin at the busy intersection of the Pinellas Trail and Main Street. 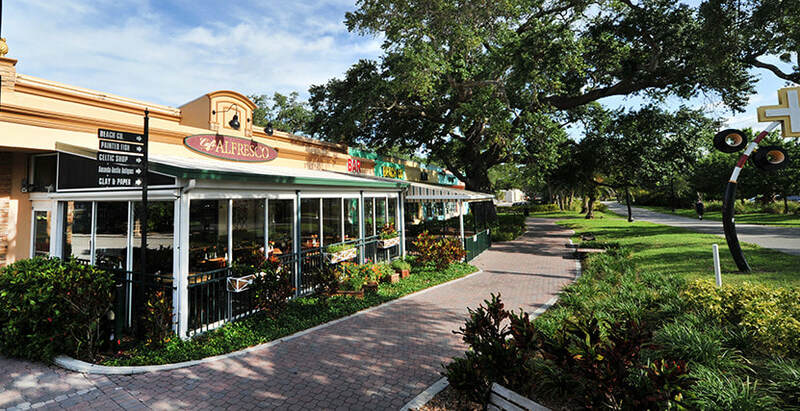 “Alfresco” means "fresh air" and the restaurant offers both indoor and outdoor dining options. Dogs are allowed on the spacious outdoor patio. The menu reflects countries around the world, combined with American cuisine. The cafe is open the following hours: Monday-Thursday 11 AM - 9 PM; Friday and Saturday 10 AM - 10 PM; and Sunday 10 AM - 9 PM. Brunch is available Friday-Sunday 10 AM - 2 PM. 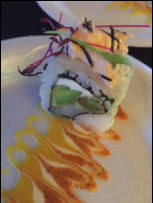 Caracara is an Asian fusion lounge located in downtown Dunedin. 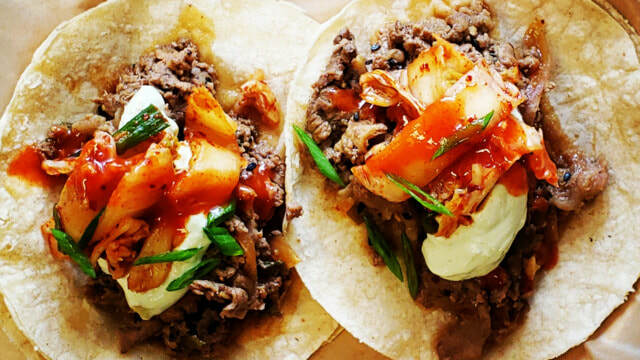 The eclectic menu shows influences of Korean, Indian, and Thai. The menu highlights several shared dishes. Boutique wines and a local and international list of draft and bottled beer are also featured. Wine-based cocktails are available as area rotating selection of house-made agua fresca. Caracara is open from 11 AM to 10 PM daily except Monday, when the restaurant is closed. Dogs are welcome on the spacious southside patio. Clear Sky Draught Haus is a Gastro Pub located on the eastern end of downtown Dunedin. The restaurant serves "Chef-Driven Pub Grub and Craft beer-infused food." More than 75 beers are available as well as an extensive menu that includes gluten free, vegetarian, and vegan fare. Clear Sky opens at 8 AM weekdays for breakfast and 7 AM on weekends for breakfast. The restaurant is also open for lunch and dinner seven days a week. 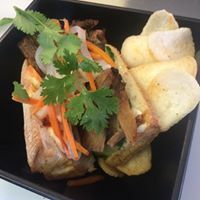 Coattails is a gourmet fast casual kitchen located in the beer garden of the Woodwright Brewing Company in Dunedin. The casual restaurant offers snacks and sandwiches such as pub fries, Bavarian pretzels, and falafal pita to accompany drinks. Dogs are allowed in the outside patio area. Coattails is open Thursday through Saturday from 5-10 PM. This family owned restaurant east of downtown Dunedin specializes in Greek, American, and Italian food. It is open daily for breakfast, lunch, and dinner. The restaurant has a side patio that is pet friendly. Open daily for lunch and dinner, Cricketers is a British pub that offers a wide variety of British and American cuisine and diverse selection of beers. 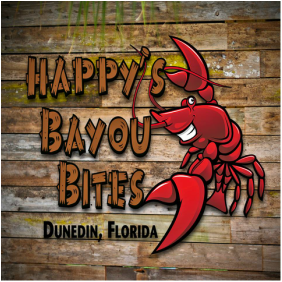 Located in a small shopping center close to the Causeway which connects Dunedin and Honeymoon Island, the restaurant is especially known for its fish and chips. Several outdoor tables in front of the restaurant are available for diners with doggies. 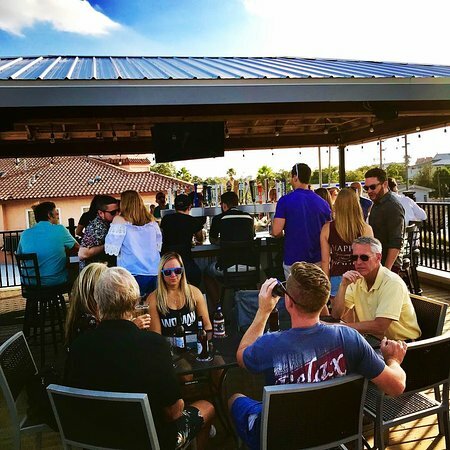 Crown and Bull, formerly Kelly's-Chic-a-Boom-Room, is a downtown restaurant, martini bar, and nightclub that has been serving food and fun in Dunedin since 1989.The restaurant's large patio became dog friendly in 2018. Kelly's serves breakfast, lunch, dinner, and drinks from 8 AM - 2 AM (3 AM on Fridays and Saturdays). 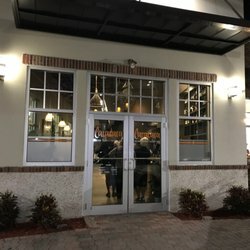 The menu includes Florida grass fed steaks, locally inspired seafood dishes, craft cocktails and beers, and an extensive wine list. Dunedin Brewery is Florida's oldest microbrewery. The brewery is open daily, beginning at 11 AM. 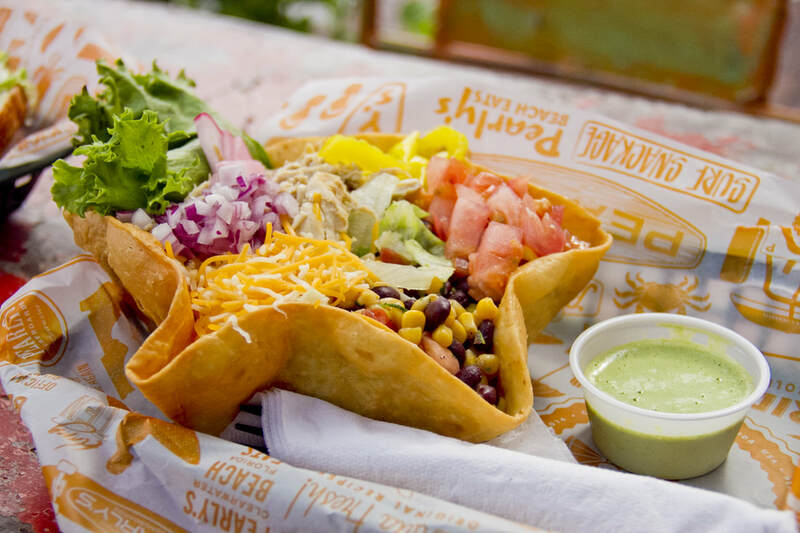 In addition to hand-crafted brews, the restaurant serves appetizers, tacos and burritos, and wraps and sandwiches. The brewery has an outdoor picnic area for diners with doggies. Musicians are often featured at night. The Dunedin Smokehouse's web site describes itself as "not your typical barbeque joint." The menu features "smoked meats and fish, homemade sauces, and some of the best side dishes made with the freshest of ingredients." The Smokehouse is open daily for lunch and dinner, beginning at 11 AM. 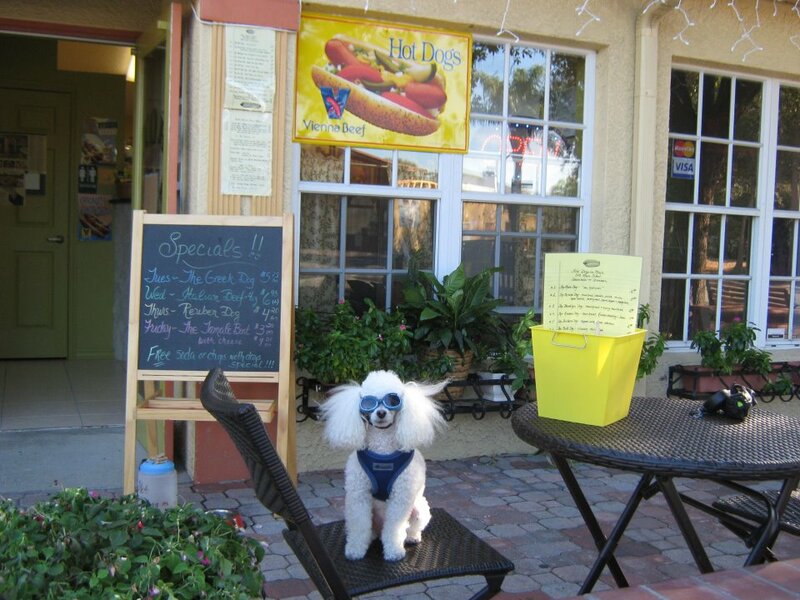 The restaurant has a large open patio overlooking Main Street where "you can bring your favorite 4-legged friend." Open daily from 11 AM - 3 AM, Eddie's Bar and Grill is "all about fun." The restaurant's web site describes it as "the only place with 50 beers on tap, 50 TVs, a full menu of great food, two full liquor bars, live music/entertainment four nights a week, outdoor patio seating, pool tables, darts and other games to enjoy -- until 3AM every day." The restaurant has a spacious, shady patio area that is inviting for outdoor diners and their doggies. 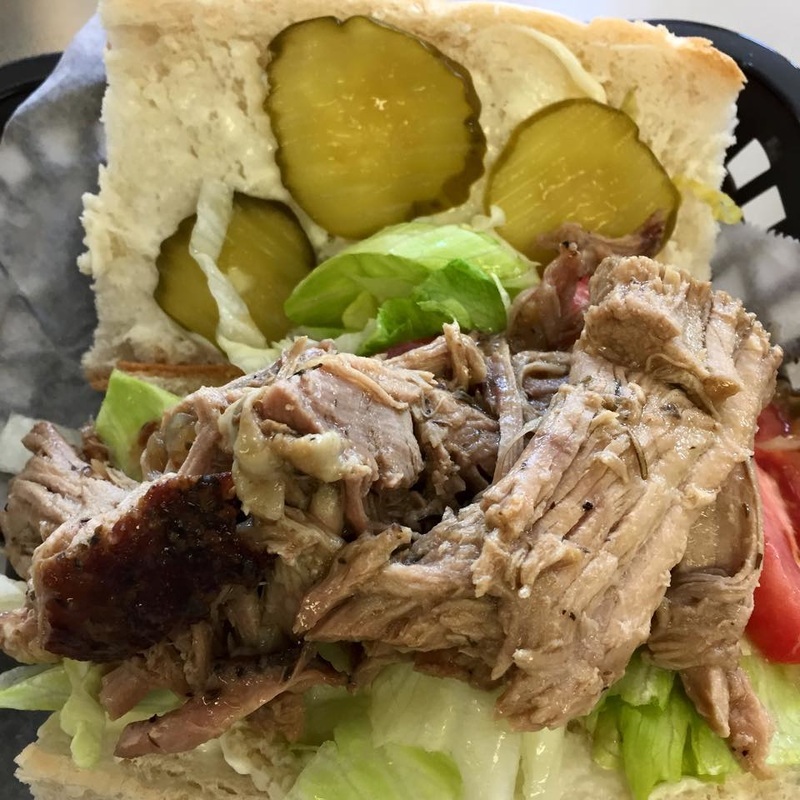 Eli's Barbecue is a Dunedin classic, specializing in barbecue (pork, beef, and chicken). 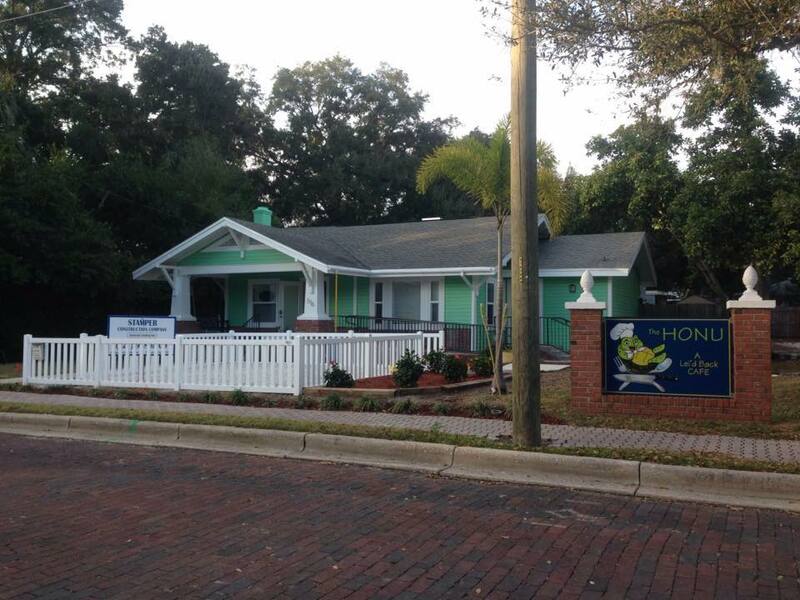 The small restaurant, located in the downtown area next to the Pinellas Trail, is open on Fridays and Saturdays from 11 AM - 6 PM. All seating is outdoor "picnic style" and doggies are welcome. 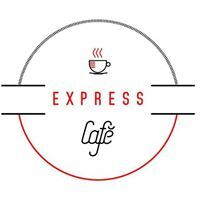 Express Cafe is a casual, European flair café serving freshly prepared foods, including an array of hot and cold coffees and fresh fruit smoothies, all express to go. 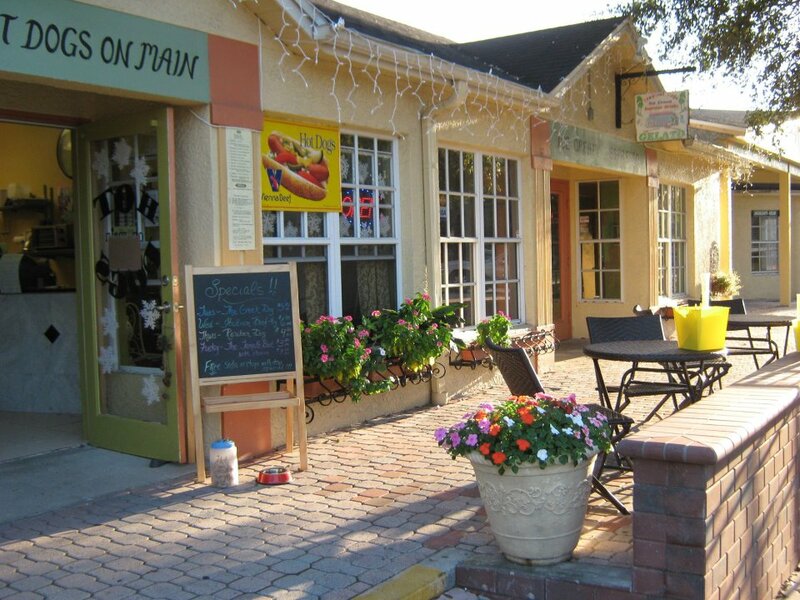 The cafe is located on the Pinellas Trail in downtown Dunedin. The restaurant serves a light breakfast fare, crepes, sandwiches, salads, sweets, and an array of beverages. It is open from 8 AM - 5 PM on Tuesdays, Wednesdays, Fridays, and Saturdays; 8 AM - 2 PM on Thursdays; and 8 AM - 3 PM on Sundays. It is closed on Mondays. Hackett's Causeway Cafe and Creamery is a casual pizza, sandwich, and ice cream shop with dine in and take out options for breakfast, lunch, and dinner. The shop is open 8 AM - 9 PM Monday-Thursday and 8 AM - 10 PM Friday and Saturday. The menu includes appetizers, soups and salads, sandwiches and paninis, pizzas, "breakfast eye openers," homemade ice cream, desserts, and a variety of alcoholic and non-alcoholic beverages. The spacious covered patio allows lots of space for doggy dining. This informal, outdoor seafood restaurant, located near the Pinellas Trail, serves Low Country, Cajun, and Florida Cracker cuisine on picnic tables beneath shady oak trees Wednesday-Saturday 11 AM - 4 PM. 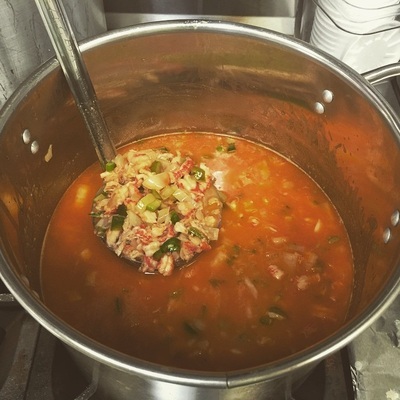 The diverse menu includes items such as Po’Boys, shrimp, oysters, crabcakes, gumbos, and muffalettas plus specials such as Creole Spiced Seafood Gazpacho. The restaurant sponsors local events and often provides live music. 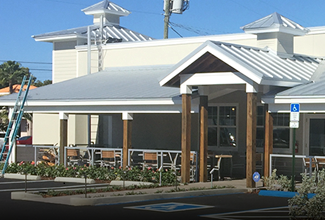 A sibling of Olde Bay Cafe and Dunedin Fish Market, Hog Island Fish Camp opened in the fall of 2015. The restaurant specializes in "salty" Southern cuisine serving a local seafood-heavy menu alongside local beer. The restaurant offers a casual, Old Florida feel, integrating reclaimed wood from the Dunedin pier into its decor. 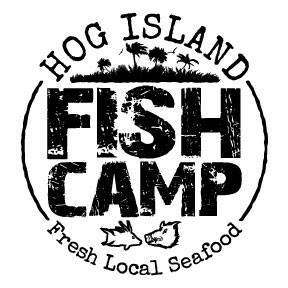 Hog Island Fish Camp is open daily for lunch and dinner. The front porch eating area is pet friendly. Home Plate Grill on the Trail is located across the street from the Dunedin Public Library and the Florida Auto Exchange Stadium, where the Dunedin Bluejays play baseball. 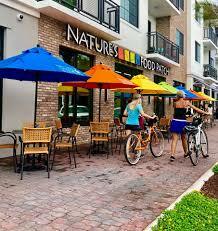 The restaurant backs up to the Pinellas Trail with easy access. The newly renovated restaurant is open Monday-Friday 7 AM - 7 PM and Saturday-Sunday 7 AM - 3 PM with featured daily specials. There are several outdoor tables in front of the grill for diners with doggies. 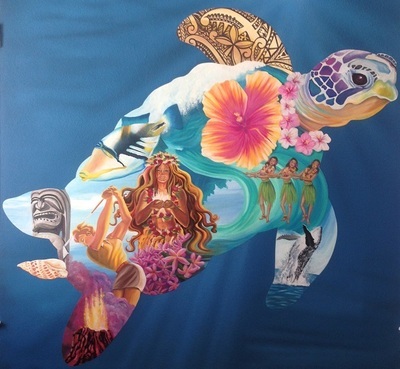 The Honu brings a fresh, colorful and fun approach to Hawaiian fare in downtown Dunedin. 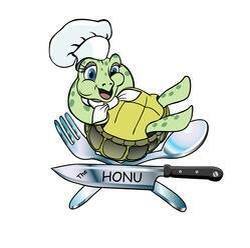 Open for breakfast and lunch seven days a week, "honu" means turtle in Hawaiian. The restaurant honors these amazing animals and invite diners to share in their continuing story that decorates the restaurant's walls. Doggies are welcome on the lanai and doggie menus are available. 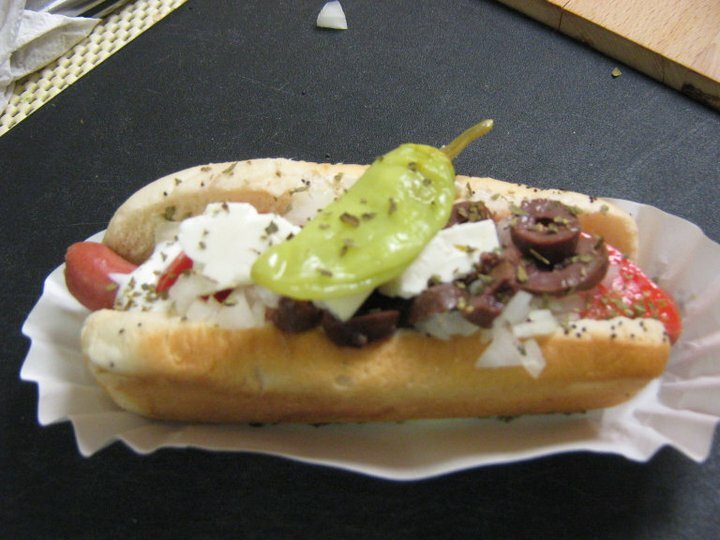 Hot Dogs on Main is a gourmet take out hot dog cafe with outdoor seating only. It is open for lunch and dinner Tuesday-Sunday. " From Chicago dogs to Brooklyn dogs we have it all, down to your classic chili cheese dog," says the restaurant's Facebook page. "We also offer Vienna sausage & beef sandwiches. On the lighter side we have a variety of specialty salads." Julian's Little Italy describes itself as a "casual Italian cafe with a warm vibe." The owners make all the food served "from the heart with love, care, and attention. The restaurant serves lunch and dinner Monday-Saturday and dinner on Sundays. 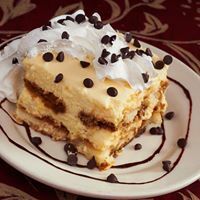 The menu includes a full array of Italian dishes and desserts. There are several dog-friendly tables in front of the small restaurant. The Little Red House is a French-American café and restaurant. 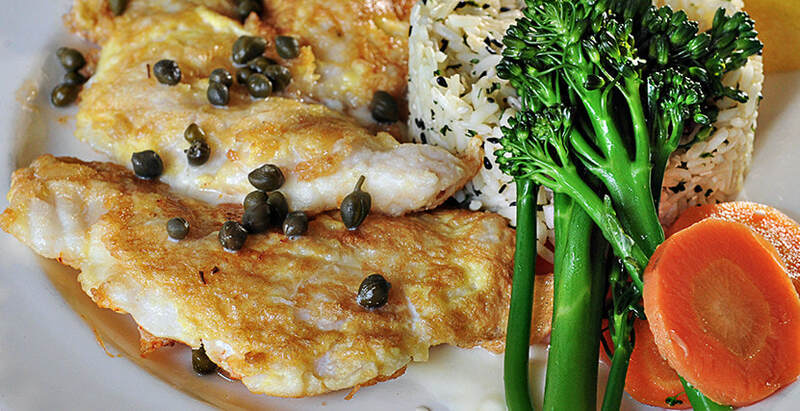 Located in the heart of Dunedin, the restaurant offers freshly prepared meals that mix French and American cuisines. Vegetarian and vegan options are available. The café offers a large selection of hot or iced coffees and teas, fresh juices, and smoothies. The restaurant is open 9 AM - 2 PM Tuesday through Sunday and 6 - 9 PM for dinner on Friday and Saturday nights. Small and medium sized dogs are welcome on leash. eclectic menu of dishes inspired by world cuisine. The Living Room describes itself as "Classic Elegance, Culinary Creativity, Simple Style, Unparalleled Taste." The restaurant is open daily for lunch and dinner plus weekend brunch. A spacious patio in front of the restaurant accommodates diners with doggies. A special doggy menu includes four "entrees." Lucky Lobster Co. is located directly on the Pinellas Trail just north of downtown Dunedin. The restaurant offers lunch and dinner, specializing in seafood, including Maine lobster, tacos, pizza, and steak. The restaurant has a spacious patio to accommodate people as well as doggy visitors. Musicians often play at night. 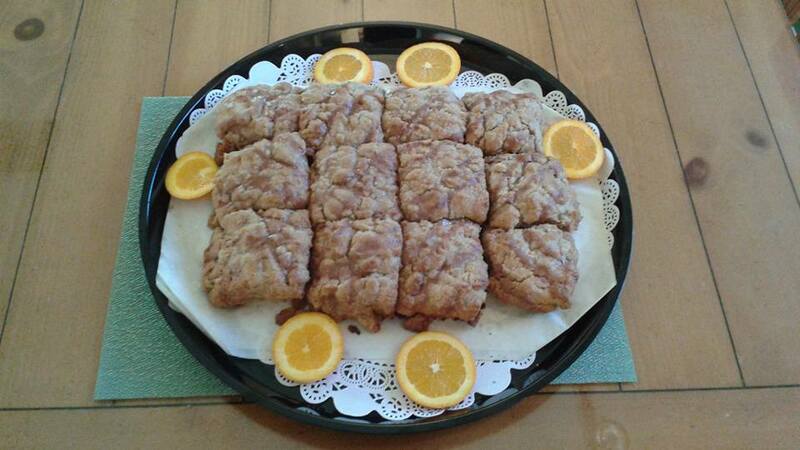 Located next to the Dunedin Public Library and Florida Auto Exchange Stadium, Marguerite's Catering and Cafe offers "delicious and diverse menus for all occasions." The cafe serves breakfast and lunch daily, with dinner also served Tuesday-Friday. 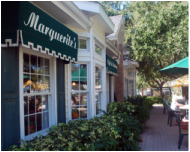 Marguerite's has a very spacious patio area where diners may enjoy a meal with their doggies. The Marina Cafe is a casual, outdoor waterfront cafe adjacent to the more formal, indoor Bon Appetit. Both restaurants share the same menu, and the Marina Cafe is open during warm weather. Diners enjoy waterfront views of St. Joseph Sound . Open daily, the restaurant serves breakfast, lunch, and dinner plus a Sunday brunch. Diners with doggies are welcome to dine in the outdoor cafe. 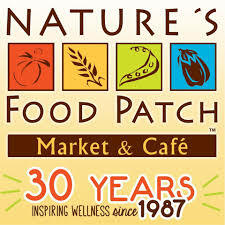 Nature's Food Patch serves healthy and organic foods to the community. 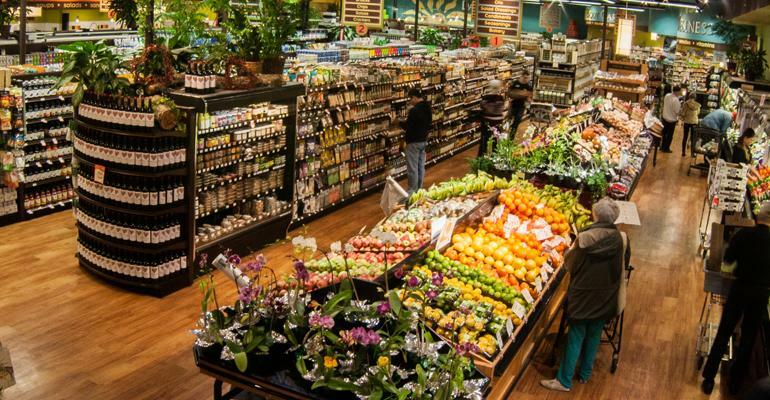 In addition to the market, the Patch has a cafe that serves soups, sandwiches, wraps, and a variety of drinks, including healthy smoothies, organic juices, and organic coffee. "To go" healthy foods are also available. The store and cafe are open from 8 AM to 9 PM Saturday, Sunday, and Monday and from 8 AM to 10 PM Tuesday through Friday. The spacious patio in front of the store is pet friendly. The Olde Bay Cafe and adjoining Dunedin Fish Market are located at the west end of Main Street, next to the city-owned Dunedin Marina, a popular destination for locals and tourists who enjoy walking along the docks among the boats or visiting the nearby public pier to appreciate beautiful sunsets. The waterfront cafe is open daily for lunch and dinner. Our Place is an all-American restaurant east of downtown which serves breakfast, lunch, and dinner 7 days a week, 24 hours a day. The patio located on the north side of the restaurant is pet friendly. 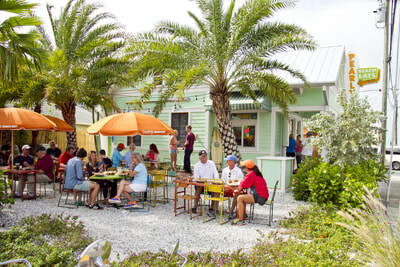 Pearly's Beach Eats began in Clearwater in 2014 and opened its second location in a historic bungalow in Dunedin in 2018. The casual restaurant and bar offers a unique blend of American, Mexican, and seafood entrees and a family-friendly kids menu. It is open every day from 11 AM - 10 PM. 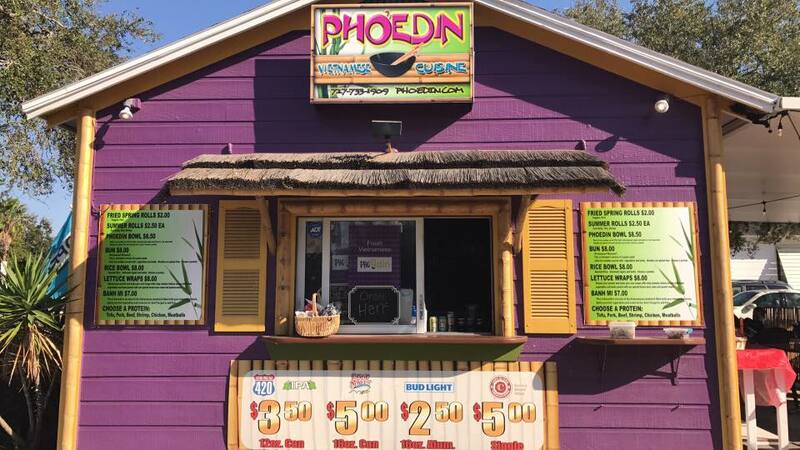 PhoEdin is a casual, trail-side cafe serving Vietnamese food. 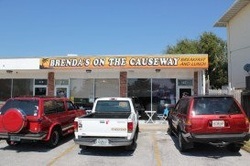 The cafe is located on the Pinellas Trail just south of downtown Dunedin. 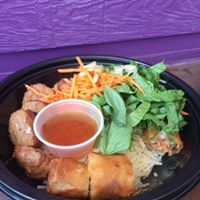 The changing menu features spring rolls, soups, rice dishes, and sandwiches. The cafe is open every day except Monday from 11 AM - 8 PM. 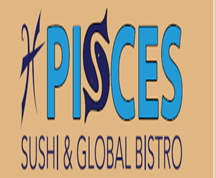 Pisces Sushi and Global Bistro, located in downtown Dunedin, is a casual, fine dining restaurant featuring global cuisine and globally inspired sushi rolls. The expansive menu features a selection of appetizers, salads and soups in addition to beef, poultry and seafood entrees. The restaurant is open Tuesday-Friday for dinner and Saturday and Sunday for lunch and dinner. An inviting patio in front of the restaurant accommodates pets and their owners. The Rusty Lyon is a sports-oriented bar that focuses on burgers, bourbon, and beer. The two-level, industrial-style restaurant includes a rooftop bar that overlooks Broadway. The restaurant is open Sunday through Thursday 11 AM - 10 PM and stays open until midnight on Fridays and Saturdays. In addition to burgers, the menu includes sandwiches and wraps, salads, tacos, pizza, dinner entrees, and a variety of sides. Dogs are welcome on the outdoor porches. The Sandpiper Cafe offers a casual atmosphere for serving pastries, sandwiches, salads and soups, fresh roasted coffee, and beer and wine. The restaurant is open 8 AM - 8 PM Sunday-Thursday and 8AM - 10 PM Friday and Saturday. The front porch and back courtyard dining area are pet friendly. Enjoy local music in the courtyard. 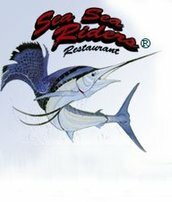 Sea Sea Riders is a popular eatery located between downtown Dunedin and the Dunedin Marina. This family-owned restaurant provides an Old-Florida ambiance in a restored 1903 waterfront home with veranda dining. 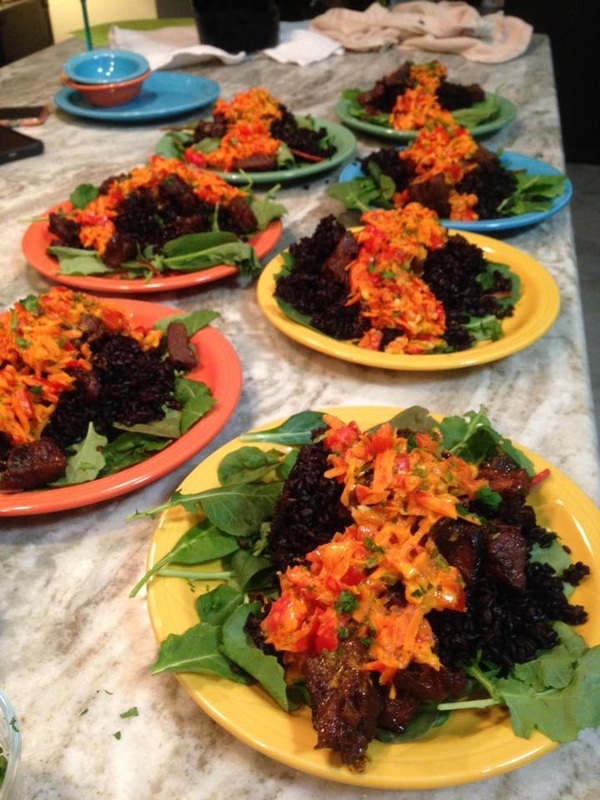 The menu strives to “bring the flavors of the Caribbean and Florida together. The goal is to marry the two geographic personalities by uniting the spirit of Florida’s past with the tastes of Florida’s present." The restaurant is open daily for lunch and dinner and has front and back porches available for dining with doggies. The South Pavilion Cafe is a waterfront restaurant on the beach of Honeymoon Island State Park. The cafe is open daily 9 AM - 5 PM and offers a special pancake breakfast on Saturdays and Sundays from 8:00 - 10:30 AM. The cafe serves a variety of sandwiches, snacks, and drinks. Daily specials include locally caught fish. A small section of the outdoor eating area is pet-friendly. Strachan's is a very popular ice cream shop in downtown Dunedin. Open daily, the shop is open from 11 AM to 9 PM Monday through Thursday and 11 AM to 10 PM on Fridays and Saturdays. 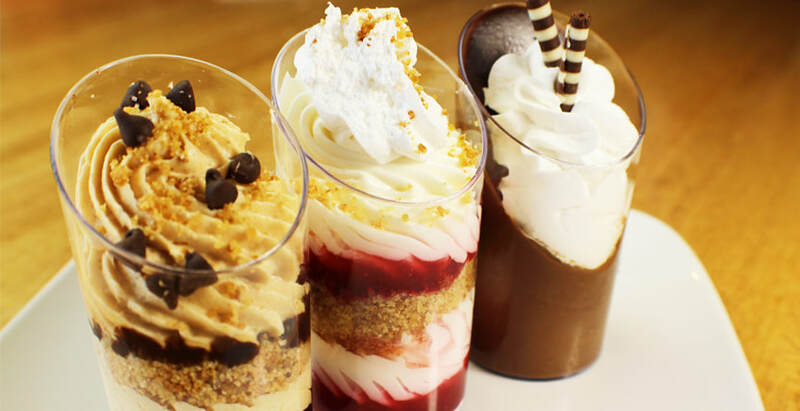 The shop offers ice cream, pies and cakes, brownies, fudge, and floats and smoothies. With each purchase, customers get a free ice cream cone for their doggies. The shop has a side patio where owners and doggies can enjoy eating.